The recent droughts in Texas have put tremendous stress on agriculture and natural landscapes throughout the state – from the desert west to the forested, usually-wet east. A few municipalities have found themselves in tight spots as lake levels drop and new sources haven’t been identified. The good news, though, is that on the whole Texans have done an amazingly good job of preparing for drought in supplying water to homes and businesses in the cities and communities of the state. The population of Texas is expected to go up 85% over the next fifty years. Some areas, such as Dallas-Fort Worth and their suburbs, are expected to double in population. Needless to say, growth on this scale will stress the natural resources our prosperity is based on. But in the case of municipal water supply, there is enough water already developed to give Texas cities a bright water future – if communities make sensible decisions. A combination of conservation, recycling of municipal water supplies (often called reuse), and obtaining water from existing underutilized lakes can provide Texas’ cities with a bright water future at a small fraction of the infrastructure costs that some water developers are telling us we “need”. Reuse speeds up these natural processes. Modern technology has produced ultrafiltration membranes that can filter the water enough to safely put it directly back into a city’s water supply reservoir. Created wetlands, specially designed to “polish” water, have the wonderful side effect of providing habitat for thousands of migratory waterfowl, wading birds, and other wildlife. Reuse is not only less expensive for the water user, it avoids the huge negative economic impacts of building a new reservoir. One of the best-kept “secrets” in water development in Texas is that we don’t need to build any new reservoirs to meet Texas cities’ future water demands. That doesn’t mean that every city already has all the water it needs. It just means we have done all the reservoir development we need. A water supply lake (reservoir) is like a savings account at your bank. When you have extra water following a rain, you “bank” it in a reservoir, to withdraw it come summer when the rains don’t come. Over time, as water flows into the reservoir and is withdrawn, the lake’s storage capacity balances out the high-flow and low-flow periods, so the amount taken from the lake can be substantially more than the low-flow periods. There are a number of reservoirs in Texas that are underutilized for water supply. Obtaining water from these reservoirs, and in some cases increasing their yield by pumping additional water into them, can meet the future water demand for Texas cities without building any additional reservoirs. In spite of this, water developers continue to promote new reservoir projects. These projects come with price tags ranging from hundreds of millions to several billion dollars. Because they are paid for with public money, decisions about them are made politically, rather than economically, as a private construction project would be decided. Water developers in the Dallas-Fort Worth area, for example, are proposing four new reservoirs even though there is enough water in existing lakes such as Wright Patman Reservoir, Lake Texoma, and Toledo Bend, to provide far more water than the region’s expected increase in demand. In other cases where a new reservoir is proposed, the water could be piped into an existing reservoir, to increase that lake’s yield, rather than impounding it to make a new lake. This would avoid the evaporation losses of a new reservoir, a crucial factor in the western part of the state. There are BIG reasons not to build additional reservoirs. Landowners in the lake site are forced to sell the lands that supply their livelihoods. Some lose their homes, others the cemeteries where their ancestors are buried, or the hunting lands dear to their heart. The timber and agribusiness industries project devastating economic results from large reservoirs, as thousands of acres of land are taken out of production. The loss of rich bottomland wildlife habitat touches everyone who enjoys the outdoors. In areas of high evaporation, developing a new reservoir can lose more water to evaporation than the amount it develops for water supply. The praises of water “conservation”, that is, using existing water supplies more efficiently, get sung by everyone in the water community, developers and environmentalists alike. In an effort to popularize conservation, however, promoters have tended to focus on things an individual can easily do, rather than on the things that will make the most difference. We’ve all heard about turning off the water while we brush our teeth, as though America’s water future was dependent on the small amount of water used for teeth brushing. The big potential savings come in water-efficient appliances, plugging up leaks in the distribution system, and – most important of all – reducing the amount of water used for watering lawns. Federal laws put limits on the amount of water used by new toilets, shower heads, and appliances. Education campaigns by cities and conservation groups have taught people not to waste as much water. As a result, indoor water use is becoming more efficient. What the average individual can do that would help most is to reduce the amount of water used outdoors. Indoor water (showers, dishwashers, etc) goes down the drain and is gathered and can be reused. Because it is reclaimed, this water is referred to as a “non-consumptive” use. Water used in our yards is taken up by trees and grass and ultimately evaporated into the atmosphere, thus lost to the system. This is a “consumptive” use. Other consumptive uses include industrial cooling and evaporation off swimming pools, but these comprise only a small fraction of the amount used for landscaping. Because consumptive uses take water out of the system and don’t allow it to be reused, reducing the amount of water for those uses is especially important. Use of native plants is a big step toward reducing yard watering. Native plants are adapted to the rainfall levels in the specific region where they naturally grow. They can create a beautiful yard, require little or no extra watering, and benefit birds and wildlife native to the area. Most people over-water their lawns. An inch a week is more than enough water even for water-hogging grasses like St. Augustine. Most grasses and landscape plants need less. Don’t water at all in the winter or if Mother Nature has done it for you. Put a moisture sensor on your automatic sprinkler system so that it doesn’t come on when rainfall has already taken care of your lawn’s needs. These three steps – conservation (reducing waste), recycling (reuse), and using water available in existing lakes together can provide more than enough water to meet the state’s future water demands. It is important to make the distinction between future municipal supplies and water demands for agricultural uses. Reservoirs and other infrastructure to supply water to cities and towns cost too much to be economical to use for agricultural purposes. A farmer would spend more money on the water for an acre of land than the acre would produce. If, as some climatologists have predicted, the drought Texas has experienced proves to be a product of climate change, not just a limited-time drought, then there will have to be changes in Texas agricultural practices to accommodate the change in climate. Even without continuing drought, irrigators in the High Plains face changes over the next few decades as the Ogallala Aquifer is drawn down. The Ogallala Aquifer is a vast underground water resource that has accumulated over millennia. Only about 10% of the water is “recharged”, that is, replaced by rainfall. As the Ogallala is mined, the water table drops and the cost of withdrawing it goes up. In a few decades the Ogallala will no longer be able to support large-scale irrigated agriculture. We can expect to see more pastures and dry-land farming. As mentioned above, decisions about water supply are made politically, by city councils, water district boards, and state water development agencies. The water planning process in Texas and elsewhere is heavily under the influence of water developers who are paid large sums to build projects, whether the projects are needed or not. In Texas, for example, engineering firms that serve as consultants to public water planning committees are the same firms that would be awarded contracts to build projects worth hundreds of millions of dollars. Projections of future demand are routinely higher than the actual water used when the time comes. These projections are used to justify reservoir projects that aren’t needed for water supply. 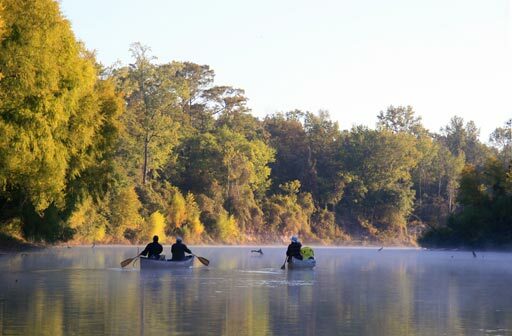 The proposed Marvin Nichols Reservoir on the Sulphur River in Texas is a stunning example. Justification for this 72,000-acre, $3.4 billion boondoggle is based on projections that people in the Dallas-Fort Worth area will be using 200 gallons of water per person per day in the year 2060. In recent years, DFW-area residents have used from 159 to 187 gallons per day. With water conservation measures already mandated law, it is absurd to suppose that per capita water use will go up over the next fifty year. Yet that is what would have to happen to justify building Marvin Nichols Reservoir. Oppose unneeded reservoirs.Tell your friends and colleagues that we don’t have to have new reservoirs in order to have adequate water supply. Tell them about reuse. And tell your elected officials, too! Reduce water wasteAnalyze water usage in your home and eliminate waste. Fix leaky faucets. Don’t overwater your lawn. Read the labels on appliances when you buy them, to be sure they are water-efficient. Install faucet aerators. Get more tips from the Texax Consevation Alliance website (PDF). Go native!Changing your yard is a longer-term project that will pay big dividends in the long run. As you replace plants, be sure to use natives. Move toward drought-tolerant grasses. Be a part of the water solution! Promote conservation, reuse, and obtaining water from existing reservoirs. Good job, Janice! Very convincing. Having served as a civil engineer for the Bureau of Reclamation, USAF, Corps of Engineers, and Oklahoma Water Resources Board from 1963 to l974 and private consulting engineer practice thereafter, I have some suggestions: 1. Read Kerr, Robert S. "Land, Wood, and Water" 2. Read Kerr, Robert S. Jr. "Mr. Water" 3. NT Matt.5:45 (KJT) "... your Father which is in heaven... sendeth rain on the just and on the unjust." Let's say your home is on a one acre lot in Oklahoma City, 43,560 sf, 30 in./yr rainfall, 2.5 a.f./yr, which is 8,147,500 gpy, 22,322 gpd. At 100 gpd/person, your property receives enough water for 223 people. A 30 unit, 3 floor apartment house of 30,000 sf could serve 55 people, an average of 2 persons per unit. The bad news is evaporation is 2X rainfall rate. 4. The 2007 OWRB Atlas, page 22 reported 18 X the state's total annual water usage flows out of the State each year, more than 11 trillion gallons, or what the population of the United States would use domestically if it were potable. 5. Every year there is flooding on the Mississippi River. I recall the same TV report listing the losses while reporting cattle liquidation sales in Texas due to drought. For many years, California has piped water from where it is in excess to where it is needed. Even within Oklahoma, the SE with 50 Ipy resists transferring it to the panhandle where they get 20 ipy. Fortunately, the West is blessed with groundwater, but not an unlimited supply, and if private sale were allowed, as with oil royalty, there would be no objection. 6. Water accounts for 90% of transportation of this world's goods, which is 1/7 the cost of trucking, the reason Argentina food can compete with produce from Colorado. Solution: extension of the inland Navigation System is needed. Senator Kerr's vision was:"The sight of America booming along its inland waterfronts makes my state more eager to be joined in this great network of low-cost transportaiton... the products and requirements of farm and industry... feeding lifebood into the economy of America... Across our land, rivers and canals will bring new commerce, new population, new growth. The hidden wealth, which has long awaited cheap transportation, will be utilized, and new cities and industrial centers will spring up where today only a shallow river hunts and follows a shifting pathway to the sea." Look at your own county: compare the cultivation 50 years ago to today. 6. Production of energy is still a major problem. Why is hydro electric not mentioned? The Kerr book studied in depth Tennessee's program. We should revisit it. Our daugher's family lived at Morristown for a time, paying half for their neighborhood lake generated power of what we do. Their Raccoon Mountain System at Chattanooga even recycles water for that purpose. 7. Admittedly, recreational use is in competition with industrial consumption and evaporation loss. However, if existing ponds and lakes were dredged as are the navigation channels, substantial additional storage without surface exposure to evaporation could be achieved, and instead of trickle pipes to control flooding by letting it go down to the Gulf, valves, could be installed to pipe it for contribution of such "raw" water by regional viaducts to the municipal lakes. 8. Certainly, water quality is an issue. The Corps Tulsa Division Engineer used to tell us, "one pint of clean water poured into one pint of dirty water makes one quart of dirty water." Another management challenge with economical solutions. Read Kerr's book.